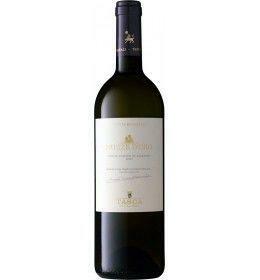 The Nozze d'Oro Contea di Sclafani of Tasca Conti d'Almerita is a seal of love between people and vines. It is the tribute of Count Giuseppe Tasca to his wife Franca after 50 years of marriage, but it is also the link between Insolia and Sauvignon Tasca, an existing clone held by the end of the Great War. 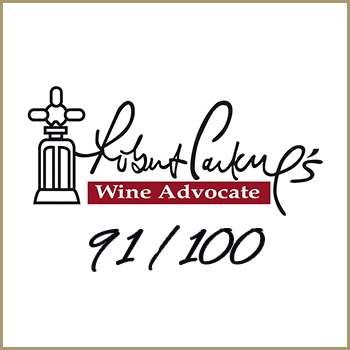 A fresh blend of young and rich in complexity after many years. 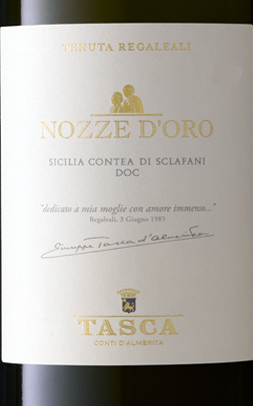 THE WINE The Nozze d'Oro Contea di Sclafani of Tasca Conti d'Almerita is a seal of love between people and vines. It is the tribute of Count Giuseppe Tasca to his wife Franca after 50 years of marriage, but it is also the link between Insolia and Sauvignon Tasca, an existing clone held by the end of the Great War. A fresh blend of young and rich in complexity after many years. THE COMPANY Our story is written in the land, the same land where for eight generations we have dedicated the attention and love that you devote to a family member. Our grandparents taught us to respect the land, keeping an eye on the future. And this vision, still today, allows us to have thriving vineyards and rich, fertile land to farm. Over the years, a precise project to enhance and develop native varieties and territories with greater wine-growing vocation led us to expand. In addition to the historical estate, Regaleali, we now have Capofaro on Salina, in the Aeolian islands; Tascante on Mount Etna; Whitaker on Mozia in the province of Trapani; and Sallier de La Tour in the DOC Monreale area. Each of these estates has a story to tell, each one recounts a different Sicily. The greatest challenge for us now is that of preserving these places to leave our children a better environment, with constant attention to safeguarding each individual ecosystem. THE PHILOSOPHY We respect the land and its rhythms We grow grapes in five different estates in Sicily – Regaleali, Capofaro, Tascante, Whitaker and Sallier de La Tour – each with its own characteristics. Different soils and climates spread across the Island and give life to a long harvest season that starts in mid-August and ends between the end of October and the beginning of November. For generations, men and women have been working alongside us, helping us to keep the pace with the seasons. We also tell about Sicily and its products through the cooking school, where the raw materials dictate the calendar. Together with the vineyards, in our fields there are olive trees and almond trees, wheat, vegetable gardens, livestock grazing, fruit orchards, all growing in their own time. Because in our world, nature is not in a hurry. Before 23,57 € tax incl. Tasting Color: Intense straw yellow. Bouquet: Fruity notes of apple, melon and peach, enriched with pleasant honey notes. Taste: fragrant, pleasantly cool and balanced. Our story is written in the land, the same land where for eight generations we have dedicated the attention and love that you devote to a family member. Our grandparents taught us to respect the land, keeping an eye on the future. And this vision, still today, allows us to have thriving vineyards and rich, fertile land to farm. Over the years, a precise project to enhance and develop native varieties and territories with greater wine-growing vocation led us to expand. In addition to the historical estate, Regaleali, we now have Capofaro on Salina, in the Aeolian islands; Tascante on Mount Etna; Whitaker on Mozia in the province of Trapani; and Sallier de La Tour in the DOC Monreale area. Each of these estates has a story to tell, each one recounts a different Sicily. The greatest challenge for us now is that of preserving these places to leave our children a better environment, with constant attention to safeguarding each individual ecosystem. We grow grapes in five different estates in Sicily – Regaleali, Capofaro, Tascante, Whitaker and Sallier de La Tour – each with its own characteristics. Different soils and climates spread across the Island and give life to a long harvest season that starts in mid-August and ends between the end of October and the beginning of November. For generations, men and women have been working alongside us, helping us to keep the pace with the seasons. We also tell about Sicily and its products through the cooking school, where the raw materials dictate the calendar. Together with the vineyards, in our fields there are olive trees and almond trees, wheat, vegetable gardens, livestock grazing, fruit orchards, all growing in their own time. Because in our world, nature is not in a hurry.